Looking for good Oriental food? 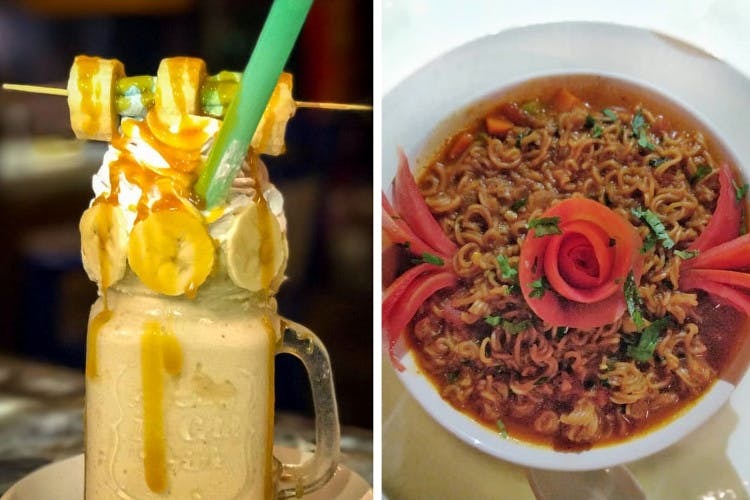 Check out Here's What's Cookin', a cafe in Madhapur that serves delicious Chinese and Asian food that's pocket-friendly too. Located in a residential area, Here's What's Cookin' is a basement turned into a cafe. Although small, the interiors are done up in a colourful but rustic fashion. There's a black-board to one side which has quirky rules for you to follow, like try something new, or talk to a stranger. The array of high stools, chairs and tables is neat and can accommodate your whole squad, making it perfect for birthday parties when you don't want to splurge but enjoy good food and have fun times. They have board games to play and books to read while you wait for your food (and you might have to wait a while) too. We got ourselves Wai Wai and NYC Street Style Noodles, along with a plate of Fried Rice. Although the fried rice was bland, the Wai Wai noodles were smooth, and had the perfect amount of hot sauce. The NYC Street Style Noodles too are recommended as they follow the recipe of the famous Halal carts in New York City, and do it very well too. For those of you with a sweet tooth, the Choco Freak Shake here is a must! Don't leave your pupper behind. Take them here as this eatery is pet-friendly, so check out what's cookin' for them. The place could use a little tidiness, and the service could be faster. Have a meal here, and then pick up a bag of flavoured popcorn from Palomitas Pop Corn Store, right next to it.